Wow, how inventive: a girl with daddy issues. Raven is the daughter of a female cultist named Arella and the demon Trigon. As a teen, Raven appeared to the Justice League of America to warn them of Trigon's threat, but they ignored her. She turned to the heroes who would become the second incarnation of the Teen Titans and together they defeated Trigon, but Raven never found herself free from her father's influence. After several encounters with Trigon, Raven allowed herself to be destroyed, although her "soul self" remained intact. Raven was the one who got the New Teen Titans together, but she was easily the most unpopular member of the group in the early days. The fans disliked her, and even the creators weren't crazy about her: it was editor Len Wein's idea to have a mystical character, and his idea to make the character female. That's all there was to her in those early days, and Marv Wolfman had to really struggle to turn that loose mandate into a workable character concept. In general, Raven has typically been drawn with a dancer's body - small breasts (by comicbook standards) and wider than average hips. This figure gets quite a few new pieces, but most of her has been used before; this is basically vintage Cheetah's body with a few alterations. Her hands are new, since none of the girls have had their fingers splayed in quite this manner, and she has a yellow ring on each index finger that's been sculpted, rather than painted. Though her torso is the same base mold as Cheetah, it's been retooled to give her a massive plug to support her cape. Now, about that cape. 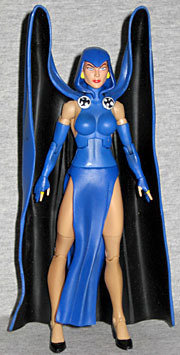 Like DC Direct, Mattel has sculpted Raven's cape with these two huge flares over the shoulders. That's okay, it's very dynamic, and it's taken straight from the comics, where the cape would billow out like that when she'd activate her powers. Can't fault them for that. But honestly, it limits the ways you can play with her. It really limits the way you can display her. She's got all the usual DCUC joints, but unless you have her standing stock still with her arms up and out, she looks unspeakably stupid. Perhaps it would have been better if they'd given her a poseable cape like her dad had, or interchangable capes - one tall like this, one laying flat. And while we're talking hypothetical changes, let's look at the face. 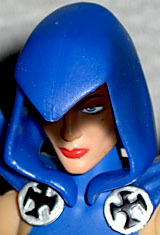 In the early issues, Raven's face was never shown at all - everything from the nose up was cloaked in constant shadow, with only the eyes left white. They could have painted her with a shadow like Snake-Eyes had, but that might have looked silly. The paint does seem slightly darker there, it must be said. Her neck has a great range of motion, so you can tilt her head until it catches the light the way you like. However, it's the sculpt that really comes up short. She has a fairly standard "Four Horsemen" face, when the character has always been drawn with a distinctly unusual look. Artist George Perez gave her a very long, drawn face, with prominent cheekbones and a high forehead, and drew her top lip larger than the bottom. Instead, the figure's face is traditionally pretty. The jewel on her forehead was an epected element, but good on them for getting the earrings way back under the hood, there. Raven comes with one of those DC 75th Anniversary collector buttons that you love so much. Remember how, way back in 2010 when we were young, all the kids were trading and collecting the pins, to complete their collections? If you do, you're on crack. Like Donna Troy, Raven's button shows part of the cover to New Teen Titans #1. Her BAF piece is the right leg of Validus. The skin is purple, the clothes are black, and the two sharp toenails/claws are pale gray. This is a leg we've seen three times before, so there are no surprises to be had. Other than the new foot, of course, but you can see that for yourself and don't need us to tell you about it. We've mentioned a lot of things that are "wrong" with Raven, but the only one that's really bothersome is the rising cape, and even that has a completely plausible excuse. It's easy to list things we would have done differently, but this is another quality DCUC release, done better than anyone's ever done Raven before. I mean, look at our complaints: her sculpt is too dynamic; the paint is too even; she's too pretty. Those aren't things that would scare you away from the figure, are they? One last "what if," though: it would have been really neat if they'd done a variant based on her superior modern (cartoon-influenced) costume.